An entity may have references of other non-entity classes. Such non-entity classes are called embeddable classes. All fields of an embeddable class are mapped to the owner entity table. @Embeddable annotation is used on the non-entity class. This is the class which is to be embedded in an entity class. 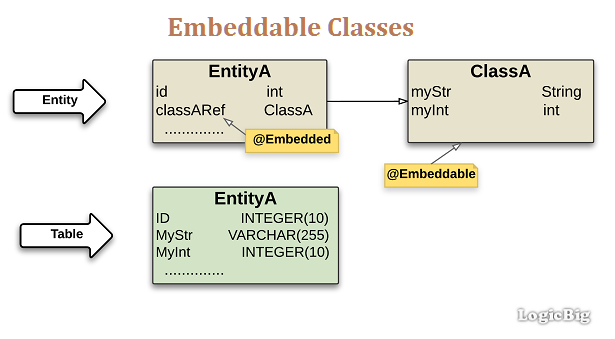 @Embedded is used in the entity class. This annotation is placed on the field/property referring to the embeddable class. Embedded objects belong strictly to their owning entity, and should not be shared across persistent entities. Embeddable class and it's fields/properties can use all annotations used by an entity (e.g. @Column etc), except for the @Entity annotation.